Double-ended highlighter offers two tips for dual purpose use: highlighting and underlining. Use handy pocket clip to attach highlighter easily to pocket, notebooks or binders. Five-color set includes fluorescent colors in yellow, pink, blue, green and orange. 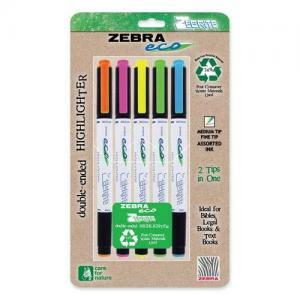 Highlighter contains 74 percent post-consumer recycled material. Nonrefillable.